Since our very first post, Lauren’s husband Scott has been bugging us to write something sports related. Although, we have told him numerous times that our readers are just not interested in scores and play by plays, he did finally win us over. 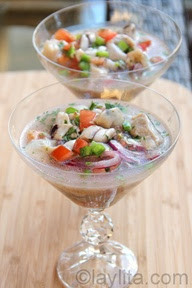 We decided it would be fun to put together inspiration for a Super Bowl soiree. You may be asking yourself … what is the difference between a party and a soiree? Well, you are in luck because we are prepared to answer that question for you. A soiree is an evening gathering given usually at a private house whereas a party can take place anytime and anywhere. In this case we wanted our event inspiration to be a bit more formal, focusing on the fancy food you might serve at this type of gathering while still staying true to this year’s teams and their locations. 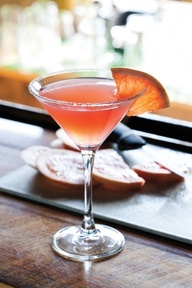 This Rudders Ruby Red Martini fuses grapefruit-flavored vodka and tart grapefruit juice with a touch of sweet orange liqueur while keeping in the spirit of the team colors. 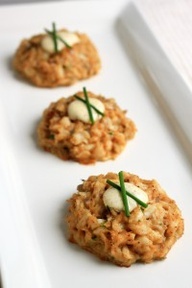 These delicious hors d’oeuvres are a Maryland food tradition which generally combine three simple ingredients: crab, mayo, and cracker crumbs (although no cracker crumbs in this paleo version). Sometimes a few other ingredients are thrown in like parsley, mustard, and of course crab seasoning. Crabs are a Baltimore delicacy. So why not make everyone’s favorite party snack, crab dip? 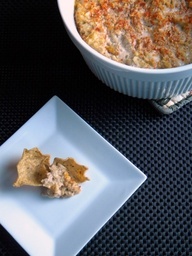 This crab dip with a kick is thick and made with a pound of lump crab meat and freshly grated pepper jack cheese. As Baltimore is known as the “Oyster City”, it is appropriate to serve oysters at your Super Bowl soiree. Serve them fresh or step it up with these oyster ceviche cups. 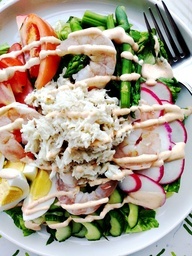 “The King of Salads” usually made of crab meat, hard-boiled eggs, tomato, asparagus, cucumber, a bed of Romaine lettuce, and a mayonnaise / red chili based dressing. Invented by entrepreneur, Louis Davenport who grew up in San Francisco and experienced many years eating large amounts of luscious crab in the early 1900’s. Sourdough bread is most closely linked to San Francisco. 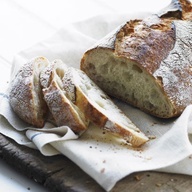 This crusty, tasty bread made of a mixture of flour, water, salt, yeast, and lactobacillus cultures is a tradition that dates back to the gold mining days. We all know the jingle, “Rice-a-Roni, A San Francisco Treat”. Here is a homemade version of this popular boxed item, made of rice, broken up vermicelli pasta, browned butter, and chicken soup mix. Smith Island, Maryland may be a small place, but its cake has a reputation so grand, it recently became the official state dessert. 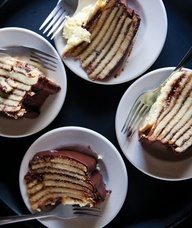 We are not surprised with its multiple cake layers and rich, fudgy frosting. Beer is the unofficial, official beverage of the NFL, and both of these cities are solid Craft Beer Towns. 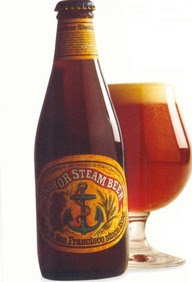 San Francisco is well known for Anchor Steam Beer, which is why it would be a great addition to this menu (plus, what would a Super Bowl soiree be without beer?). You may have also noticed that crab was featured many times throughout our menu. Crab is very popular in both of these locations, making it the perfect ingredient to tie everything together. We hope you enjoyed this inspiration post. All of the recipe links have been added for your convenience. Let us know if you make any of these dishes for your own Super Bowl soiree, and let the best team win! When creating centerpieces for any event, there are a few key elements to keep in mind including; theme, reproduction, and budget. All of which came into play when Tami and her co-worker, Nelly, were planning the decor for a school event this past weekend. Theme – The event was a luncheon as a follow-up to a beautiful student lead Shabbat service and the theme was prayer. For the past several weeks, as Tami and her students have prepared for this event, she has challenged each of her 1st – 6th graders to answer this question: What does prayer mean to you? Such a simple question to ask yet so complicated to answer. As a symbol of this theme Tami and Nelly decided to create their centerpieces as mini models of the Western Wall, which was equally challenging. Reproduction – Each of the fifteen centerpieces that were created were slightly different, however the same steps were taken to make each one. They began by using dry florist foam bricks and scuffing them up and rounding their edges to make them look like authentic bricks. They were cut in order to create this brick pattern and then glued together (using styrafoam glue) and attached to a styrafoam base for support. They also stuck two wooden skewers (one on each side) through the entire structure to make sure it would not topple over. Once each model was made, it was painted using acrylic paint in a variety of shades of brown and gray to look weathered. They enlisted the help of some other teachers and their 6th grade students to finish this process rather quickly. Budget – Once each structure had dried, smaller details were added such as faux moss and hand written blessings that each student created. All materials for this project were found at Joann Fabrics and Michael’s and were very reasonably priced. When creating on a budget it is important to make the most of your materials, and that is just what Tami and Nelly did using every last bit of what they bought. The centerpieces were displayed during the luncheon, and they were a huge hit! The parents could not believe the workmanship that had gone into this project and even mentioned how real they looked. Tami plans to take the mini walls and reconstruct them into one larger wall display while teaching the Israel unit this Spring. When she takes her 6th grade class to Israel in April, they plan to visit the real Western Wall and will take the blessings written by their classmates along with them to place in it. These handmade centerpieces certainly made a statement at Tami’s Shabbat luncheon and would be a fantastic addition to the decor of a Bar or Bat Mitzvah. We think the concept of having your guest write their own wishes or blessing for the Bar / Bat Mitzvah boy or girl would make for an amazing addition to this type of event. If a family doesn’t plan on going all the way to Israel for this special occasion, the symbolism behind these centerpieces would serve as second best. This is just one of many centerpiece ideas or concepts we can come up with using any theme, amount of guests attending, and budget. Side by Side Design would love to help you come up with and create those perfect details for your next event. Contact us at sidebyside.design@yahoo.com. Today is Robyn’s (Lauren’s Mother-in-Law) birthday, and we thought we would celebrate by sharing one of her craft specialties with all of you. We pride ourselves on using handmade cards and tags whenever possible and feel like we have our own distinct style (as seen on many previous posts including: Handmade Card Gifts and Giveaway). We do, however, have somebody to thank for inspiring us to do this, and that is Robyn. She is diligent about creating unique cards for each birthday and event (and even some holidays) and oh so humble about her talent. Birthdays are big in the Gwartz family. Robyn loves to spoil her three children and their significant others with bright colored birthday cards. As you can see, she keeps things consistent year to year by including the birthday boy / girl’s name and the age they are turning. This is a great personal touch. We love that Robyn signs the back of each card with her signature heart stamp, her name, and the year it was made. She uses her Cricut often to create die-cuts to use on her cards as well as fun stamps she has in her collection. Even with an entire room full of crafting materials, Robyn finds herself constantly wanting to buy more. Robyn doesn’t leave a single detail out. Even the inside of her cards coordinate nicely with the front cover and contain a special message for the recipient. Notice the adorable “Scottie” dog on this card for Robyn’s first born, Scott. This adorable tag was made with love for Robyn’s soon-to-be granddaughter and once again was made to match the wrapping paper used. Robyn admits she is getting into glitters, and we are so glad she has joined us! We love this simple yet beautiful card created for Scott and Lauren’s first anniversary. She has also been known to mail her kids Valentines and even Halloween cards. As a pre-school teacher she cannot help herself! This Valentine, complete with homemade gift card holder, was sent with love. Robyn shares this hobby with her two co-workers. They enjoy shopping for supplies together while teaching each other different techniques along the way. We were surprised to find out that she is also inspired by us. In fact, she has started using initials (which has become one of our signatures) in her own card design. Robyn’s creativity and dedication continues to inspire us in many of our own craft endeavors, and for that we thank her. Happy Birthday Robyn! May this year be filled with many reasons to celebrate and create! We had two shared wishes for this birthday … #1: That the weather would warm up (as it has been freezing here in Southern California) and #2: That we would just be able to relax with friends and family while not going overboard this year. We are happy to say that both of these birthday wishes ended up coming true. This past week, by some miracle, the temperature went up a bunch and has been in the high 70’s. Despite the fact that we love to sit outside, the beautiful weather made it even more obvious that we needed to choose a location for our intimate birthday dinner with a relaxed outdoor patio vibe. The Wilshire in Brentwood was the perfect place to relax on our birthday after a long day of work. We decided to keep it small (just a few close friends), and we could not have been happier to sit outside with heat lamps to keep us toasty, a glass of wine (for Tami only, of course), and great conversation with friends. Lauren chose the Wilshire for its comfortable yet sophisticated decor as well as the delicious menu. Tami was excited to try out a new spot close to home that is known for its local, organic, and seasonal ingredients and beautiful but casual atmosphere. We were very pleased with our menu selections, consisting of: broiled black cod, pan roasted jidori chicken, mac n’ cheese with spinach and two different types of cheese, honey roasted beets, and truffled fries (which were not photographed because they were gone before we knew it!). Our waiter, who is also a twin, brought us a special dessert for two. This sticky toffee pudding was to die for and the note on the plate was cute too. We have made it a point, since Tami moved back to Los Angeles two years ago, to celebrate our birthdays together. This was not a big birthday, thus an intimate birthday dinner was just what we needed. Nonetheless, we are another year older, another year wiser, and as close as ever. Yesterday was our birthday, and as much as we love to celebrate together, this year we decided to keep it very low key. In order to keep it casual, we did not have a birthday party, kept the present budget to a minimum (although Lauren’s husband Scott did send both of us flowers at work), and even the treats we made were super simple. 1. Mix together a package of white cake mix (yes, from a box), 1/4 cup milk, 1/4 cup heavy whipping cream, 1/4 cup canola oil, 1 teaspoon vanilla, and 1 egg. 2. Add in 1/2 cup white chocolate chips and sprinkles. This is your chance to be creative! We used rainbow sprinkles, but you may decide to just use your favorite color or those fun sugar ones that we love so much! 3. Bake in a greased 8 by 8 pan for about 25 minutes at 350. They are best when not overcooked. In fact, we like them a bit gooey in the middle. 4. Wait 20 minutes before cutting into and eating so that they set. As twins, we have gotten used to sharing our special day and have loved celebrating with so many others this month. A huge Happy Birthday wish goes out to our girl Paige from Craft Club, Lauren’s Mother – in – Law Robyn who is as sweet as they come, our brother Noam who always makes us smile, our “Aba” (Dad in Hebrew) Jackie who we love so much, and all of our readers with January birthdays. We wish you only the best this year and hope you will treat yourself to something sweet … you deserve it!